I suddenly realised that over here in the UK you have no offline presence at all. No skyscraping head office, no billboards and no sponsored parks or roundabouts. How could this be? Especially with you being such an incredible international social media tour de force. This got me thinking. I believe I have one of the most sociable cars ever built. It also just happens to be ‘Twitter‘ colour. As the car is so rare in the UK people already stare as I drive by. Wherever I park, people approach to find out more. What is it? Where is it from? Why do you have it? What is this Twitter car? What’s it all about? It would be a cinch to also have real-time, location based tweets scrolling across the rear window. Social media folk know all about Twitter. Let’s make social media even more sociable by reaching out of our echo chamber and into the wider world. 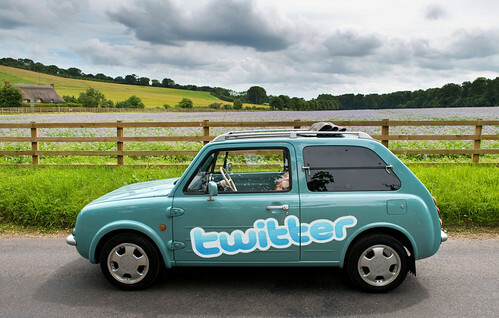 I am happy to be the driver/chauffeur/pilot of the ‘Twittermobile’. I could even do interviews in the back seat. Talk to me and lets take twitter offline and into the minds and streets of the British people. Random donations are always welcome and deeply apreciated on my support page. This is genius! I love the idea. Christian, corporations in the States support this type of advertising , often. Twitter needs to take your offer. Sorry, but I’m so pissed at Twitter right now due to their truncating tweets and refusing to acknowledge the issue until a short while ago, plus an entire f#cking week of hell since they introduced their new front-end changes, which were supposed to be “little” changes, nothing big, that I really can’t cheer on even the concept of a Twitter car right now. I’d feel much better if they stuffed that car full of WORTHY developers, people who actually know how to code, customer service people who actually respond to requests, and a twitter interface that actually works. They screwed up our custom backgrounds in favor of making cute little Twitter themed backgrounds that many of us don’t want. They squash the little individuality we do have. They never asked us if we’d want the changes, and then when they implement these forced changes upon us, they break twitter. So I say, get your act together, twitter. Or there won’t be anything to twitter about, because one of your competitors will come along and make a better twitter. I’d gladly go to a better twitter. I’d rather twitter itself got better, but that doesn’t seem likely. Again, with the truncated tweets and totally screwed up new design, with features we DON’T want, you picked a bad day to post this. Hi Phil, If i were you I would approach either of the ‘Blip’s’.. It’s a small car.. i think traveling across America as a ‘Blip on the landscape’ would be a great project..
Great idea… But would you get mobile coverage by the field it is parked next to? Of course.. I have 3G and all other kinds of tech..
yes splendid idea, how can i help? ooh no… I love the car Christian, but it always make my bum go funny whenever I see branding all over a car. I am afraid it has come to the brand it or bin it stage..
A great Idea Christian. There are many companies here in the states that to Advertising wraps for cars. Nothing like that on your side of the pond? Re: @philcampbell and his mini…tinyurl! That looks like a cool car, what is it? It would be cool if you had two LED panels that were hooked up with a 3G SIM (or something that got you a connection) that allowed the car to display your tweets and also show your @’s! Probably make you drive really well too so to avoid any @ backlash from fellow drivers. Just came across this. what an awesome idea. fingers crossed it gets picked up. Paid to twitter on about twitter. you ‘d need like a similar coloured jumpsuit with twitter emblazoned on the back as well!